Cal-Maine Foods has issued a voluntary egg recall, as the involved eggs have the potential to be contaminated with Salmonella Braenderup. 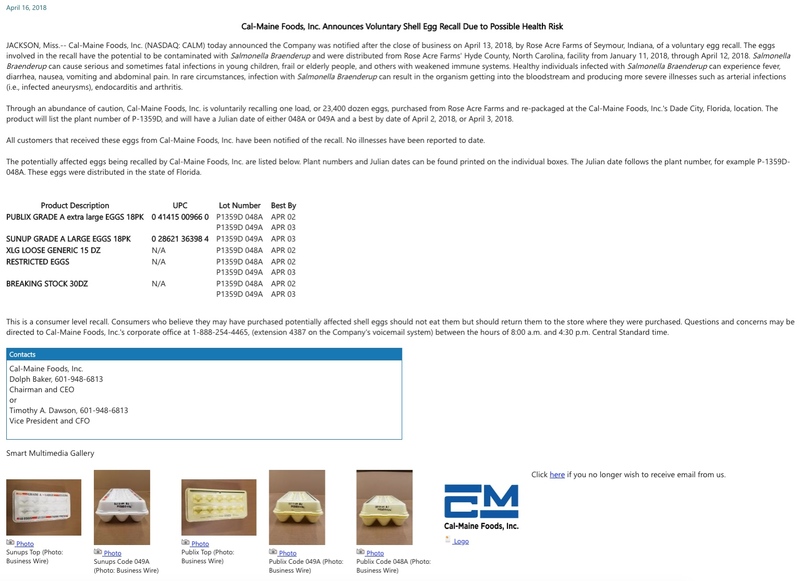 According to a press release from Cal-Maine Foods, the company was notified of a Salmonella Braenderup -related recall issued by Rose Acre Farms on April 13, involving eggs from its facility in Hyde County, North Carolina. The Cal-Maine eggs in question were distributed from that same facility. The Cal-Maine recall amounts to one load, or 23,400 dozen eggs purchased from Rose Acre Farms and re-packaged at Cal-Maine’s facility in Dade City, Florida. The affected products will list the plant number of P-1359D, and will have a Julian date of either 048A or 049A and a best by date of April 2, 2018, or April 3, 2018. A more detailed listing of the eggs recalled by Cal-Maine Foods can be found on the company’s website. These eggs were distributed in the state of Florida. Salmonella Braenderup, according to the U.S. Food and Drug Administration (FDA) can cause serious and sometimes fatal infections in young children, frail or elderly people, and others with weakened immune systems. Healthy individuals infected with Salmonella Braenderup can experience fever, diarrhea, nausea, vomiting and abdominal pain. In rare circumstances, infection with Salmonella Braenderup can result in the organism getting into the bloodstream and producing more severe illnesses such as arterial infections (i.e., infected aneurysms), endocarditis and arthritis. The recall issued by Rose Acre Farms involved 206,749,248 eggs that were believed to have possibly been contaminated with Salmonella Braenderup. Those eggs were distributed in Colorado, Florida, New Jersey, New York, North Carolina, Pennsylvania, South Carolina, Virginia and West Virginia. There were 22 illnesses that were linked to possible consumption of the eggs.